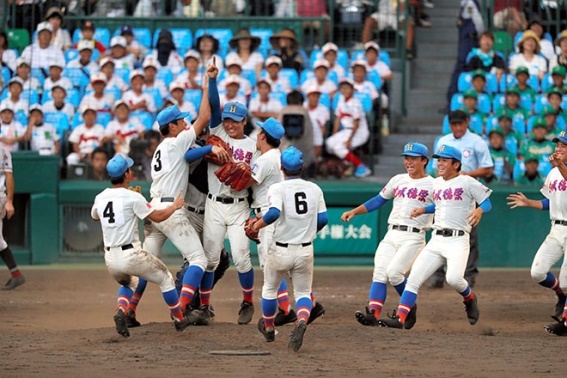 The Hanasaki Tokuharu High School team celebrates its victory in the final of the national high school baseball tournament at Koshien Stadium in Hyogo Prefecture in Aug. 23. The team won in convincing fashion, destroying Koryo High School of Hiroshima by a score of 14-4. NISHINOMIYA, Hyogo Prefecture　（August 23, 2017 THE ASAHI SHIMBUN）　--　Hanasaki Tokuharu High School gave Saitama Prefecture its first championship at the summer national high school baseball tournament by crushing Koryo High School of Hiroshima 14-4 on Aug. 23. Koryo could not solve Hanasaki Tokuharu’s potent offense, but then again no other team in the tournament could silence the Saitama players’ bats at Koshien Stadium here. The school, located in Kazo in northeastern Saitama Prefecture, finished the tournament with double-digit hits in all six of its games. Millions of people follow the summer tournament on TV, and the stadium stands are consistently packed with thousands of spectators each day. Koryo reached its fourth final in the summer baseball tournament, but it has still not won the championship. Its loss also ruined a story-book ending for Shosei Nakamura, the Koryo catcher who set individual records for most home runs (6) and most RBIs (17) in a single tournament. He also tied the record for most hits at 19. He broke the home run record set in 1985 by Kazuhiro Kiyohara of PL Gakuen in Osaka. Kiyohara went on to a long career in professional baseball, but he was convicted of drug possession in 2016 after his retirement.